Last year my 8 year old requested a Minecraft Birthday Party. Besides understanding on a basic level what it was I had to do a bit of research. It was a large group so it wouldn’t have made sense to have kids playing video games the whole time so I was trying to come up with other ideas for activities. 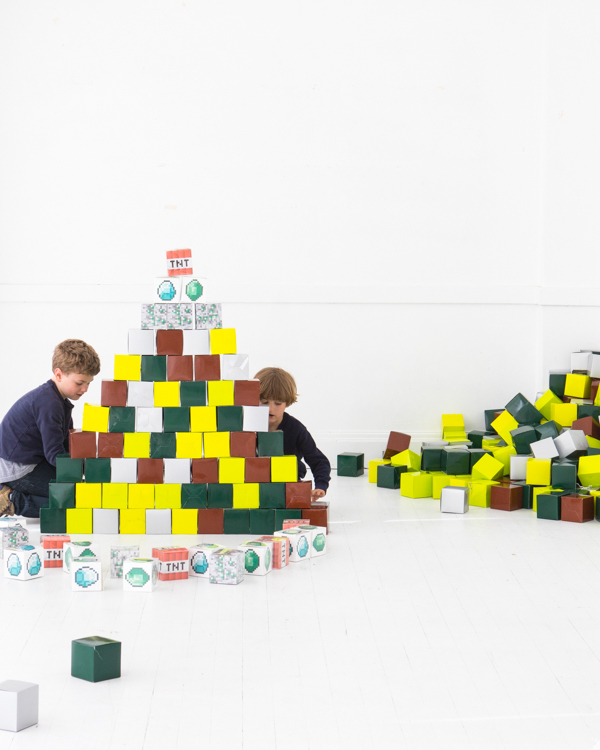 I decided to make a giant real life Minecraft Birthday Party with paper blocks. I love taking my kids’ party requests and turning them into a cool and fun design-y party. 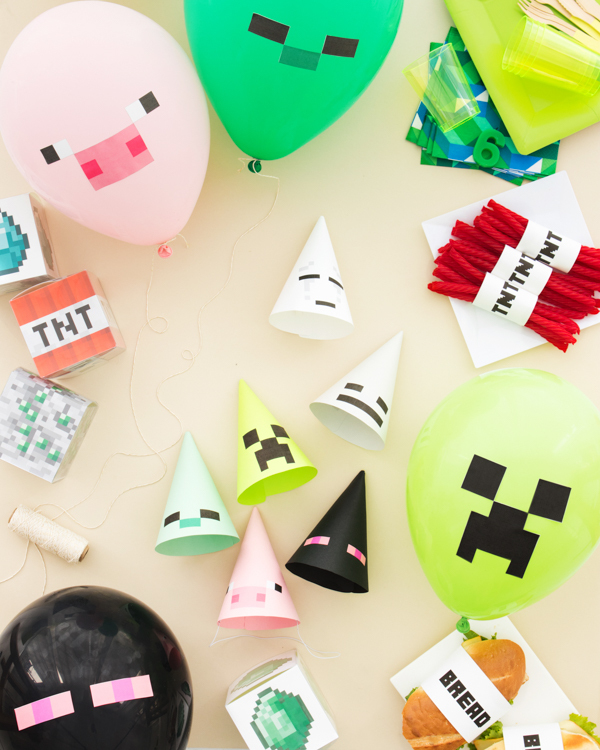 This is the Oh Happy Day take on a Modern Minecraft Party. The main focus of the party was on all the blocks. I ordered lots of light and dark green 4″ square boxes from Paper Mart. I also supplemented with small amounts of brown, grey, and clear boxes. (The clear ones we added inserts into to make TNT and Diamonds etc.) Before the party my kids prefolded all the boxes and we stored them in giant garbage bags so it was easy to transport them. The kids at the party LOVED it. 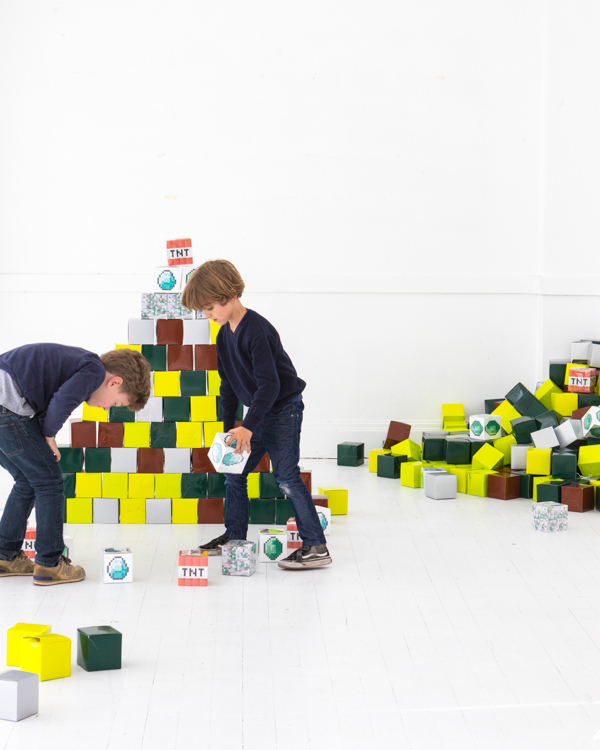 They built giant towers and knocked them down. At one point in the party my teenage nephew came in with a milk crate over his head and pretended to be a Creeper. It was VERY exciting for a big bunch of 8 year olds. 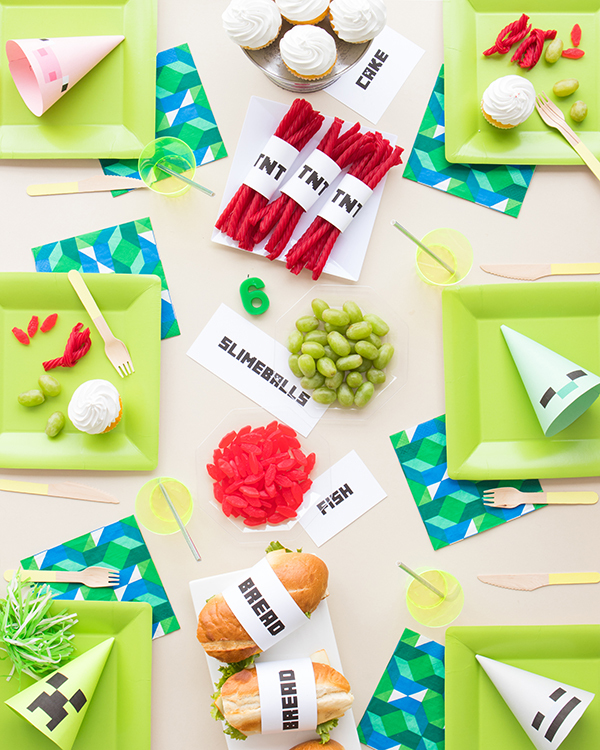 For fun party details we added labels to the food just like the video game. 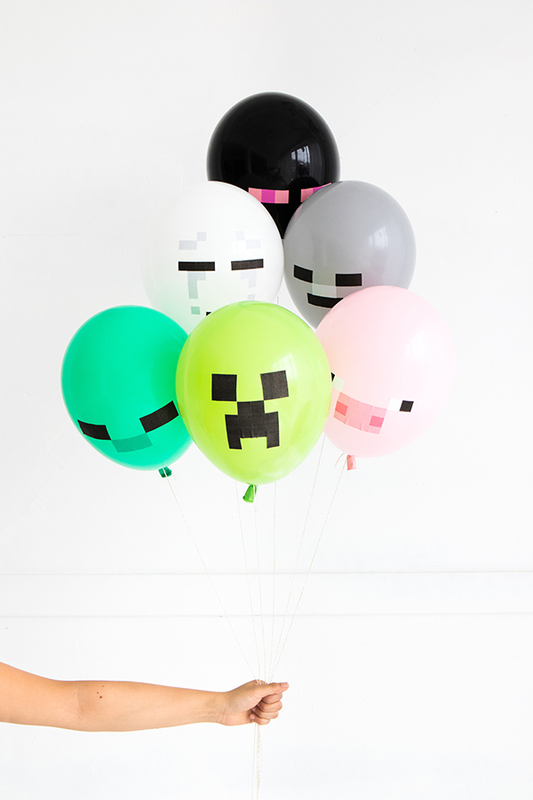 For decor we added homemade Minecraft party hats and homemade Minecraft balloons. Not sure I ever want to throw a 20-kid birthday party ever again but the kids had fun. Ha! 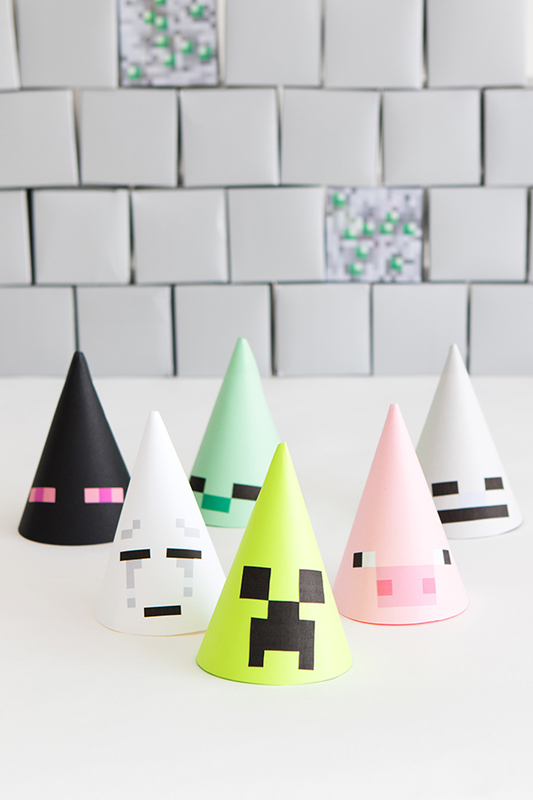 Step 1: Download and print out the Minecraft character hat printable onto a full sheet label sheet and cut out the individual pieces for each character. 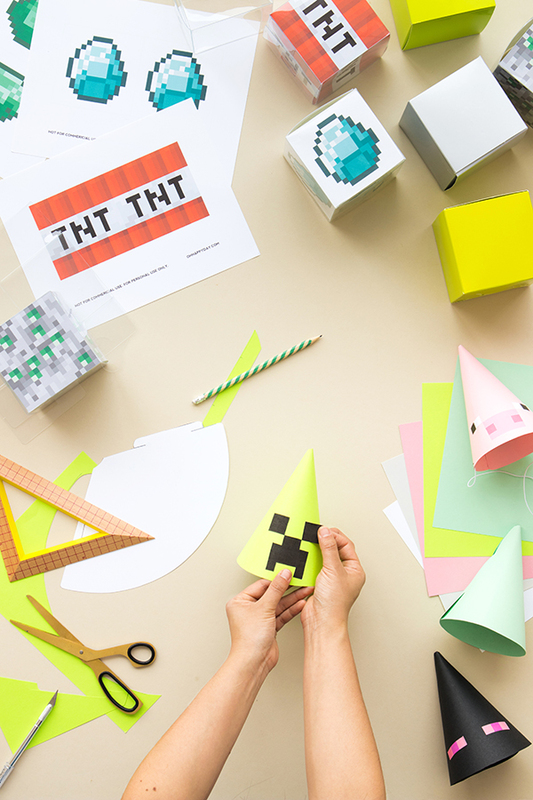 Step 2: Download the party hat template and print onto colored cardstock. Cut out and assemble. Step 3: Stick the character’s face onto the party hat. Be sure to attach the stickers toward the bottom of the hat so the face is fully visible. Step 4: Staple elastic to the sides of the hat and wear! Step 1: Print and cut out 3 copies of the printable templates. Step 2: Fold each of the 3 pieces in half, using the center line as your guide. Cut one of the folded pieces in half. Step 3: Assemble a clear box. Insert the folded pieces into the box, along the sides. Tape down the paper inserts to the box if needed. Put one of the half pieces at the bottom of the box and affix the other piece to the lid of the box with a small piece of clear tape. Tuck in the tab of the box lid. Step 4: Build a bunch of colorful paper boxes, too. 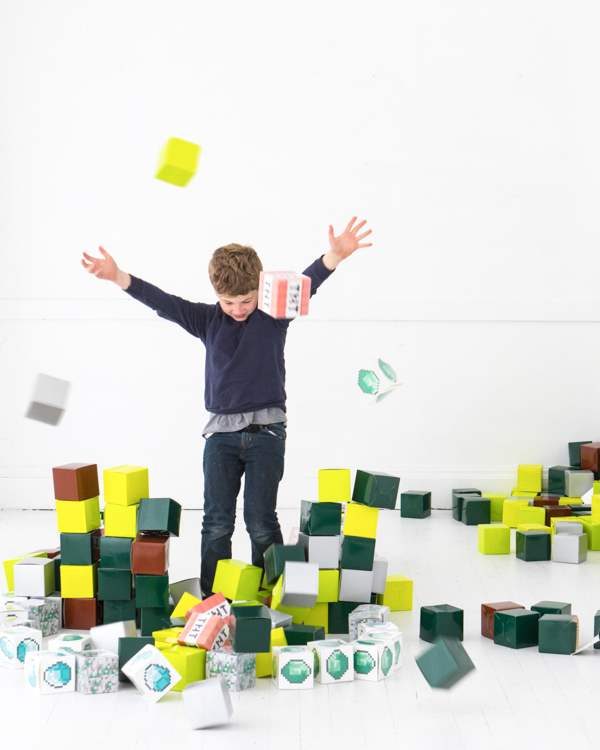 Pile them up for the party and let their imaginations run wild! This is SO cool, what a dedication to the theme!